The compelling, inspiring, and comically sublime New York Times bestseller about one man’s coming-of-age, set during the twilight of apartheid and the tumultuous days of freedom that followed. The eighteen personal essays collected here are by turns hilarious, dramatic, and deeply affecting. Whether subsisting on caterpillars for dinner during hard times, being thrown from a moving car during an attempted kidnapping, or just trying to survive the life-and-death pitfalls of dating in high school, Trevor illuminates his curious world with an incisive wit and unflinching honesty. His stories weave together to form a moving and searingly funny portrait of a boy making his way through a damaged world in a dangerous time, armed only with a keen sense of humor and a mother’s unconventional, unconditional love. 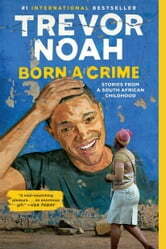 It shouldn't surprise anyone familiar with Trevor Noah's work that his childhood memoir is fantastic. For those less familiar (like myself), I promise that after turning the final page, you'll immediately want to know more about this brilliant man. Books allow you that miraculous trick of experiencing life from someone else's point of view, and holy heck, does Born a Crime do exactly that. This is Noah's coming-of-age story, one spent as a "colored" child of black and white parents in apartheid and then post-apartheid South Africa. It's as clever as you would expect from the new host of The Daily Show -- but it's also a shocking, insightful, and wildly intelligent evisceration of racist, gendered, and class social constructs, from someone who was as defined by these social "rules" as much as he was rejected by them. Noah opened my eyes to a time in history that I really don't know enough about, but what I will remember more than anything else are the stories of his mother, Patricia. What a woman. She is the hero of Trevor's story, and her love for her family (and Trevor's love for her) is sincerely humbling. This book made me laugh, I mean belly laugh at a point in my life where I needed it. It also made me cry and renew my faith in the power of God. I believe in miracles. Thank you Trevor Noah I loved your book. I didn't realize how little I knew about South Africa and apartheid until I read this book. Mr, Noah provides an incredible detailed way apartheid effects every race so deeply. It's sad that the rest of the world is so ignorant about the atrocities of this regime. He writes about growing up in this society. This is a book about survival, family, love and rising above everything regardless of who people judge you to be. A wonderful read that is both funny, heartbreaking and educational at the same time. It's amazing that Trevor seems such a genuinely nice guy, someone who doesn't carry hate in his heart despite the things he's endured. I look forward to a second book that picks up with him coming to America. interessant, captivant, touchant et drôle! J'ai eu beaucoup de difficulté à mettre ce livre de côté quand il le fallait, addictif! Bravo !